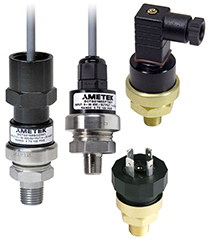 AMETEK’s Model DCT pressure transducer is a digitally compensated unit available with many different outputs including 4-20 mA, 1-6 VDC, 1-5 VDC and 0-5 VDC. Process connector options include 1/8” or 1/4” NPT and 1” NPT flush mount, in either brass of 316 SST. Accuracy is excellent for the industrial transducer, less than ±0.3% full scale over pressure and less than ±1.0% full scale over a wide compensated temperature range. The DCT is offered in pressure ranges from 0-1 psi through 0-3000 psi, to cover a broad range of applications, in absolute, compound and gauge pressure types. Standard electrical connectors include 18” cable, Packard connector, DIN-A, and DIN-C. The Model DCT can be customized for OEM’s, such as special pressure ranges, tighter calibration, different electrical connections or pressure connections, etc. Please contact customer service at mctpmt.sales@ametek.com to discuss any special requirements or customization.